It's getting to that time of year again — deciding what to buy your sporty significant other. That's where PlayBetter comes in. Dedicated to sport wearables designed to get more out of your game, PlayBetter aims to get you a better deal by bundling together kit at reasonable prices. We've compiled the list of gift packages below to help you pick the perfect Christmas present for anybody looking to receive more insights into both their round and general activity — whether that's from dedicated devices or more standard fitness trackers and smartwatches. Coming with a stainless steel bezel and black silicone strap, the Approach S60 allows you to access over 40,000 courses from the 1.2-inch colour touchscreen, while also keeping tabs on your strokes through auto-shot tracking. Once you fire up a recognised course, the in-built GPS will be able to calculate your distance to the green, water hazards and bunkers, with Garmin's slope-adjusted 'PlaysLike' distance metric and swing analysis involved, too. If you're willing to shell out a bit more, you can pick up a tempered glass screen protector - perfect for any loose drives that happen to come your way - USB car and wall charging adapters and a protective hard case for when not in use. The Approach S20, while possessing much of the same smarts as its siblings, also doubles as an everyday watch. It brings the same 40,000 courses, as well as automatic map updates, daily activity tracking and notifications for the likes of texts and emails. When on the course, you'll see precise distances to the front, back and middle of the green, as well as Garmin AutoShot round analyser, which tracks your shot distances and records them for review through Garmin Connect. The S20 also brings up to eight weeks of battery life when in activity mode, while you'll also get an impressive 15 hours in GPS mode. Similar to the bundle above, you can also keep things safe when not in use through the protective case, while backup chargers will see you free to add some juice from your car. Offering a similar design to Garmin's range of fitness trackers, the Approach X40 is the only dedicated golf watch from the company to offer continuous heart rate monitoring. That means you can not only go back and see how your ticker was handling the pressure of that 18th hole putt, but also throughout the day, too. Like with its siblings, the same courses are available from the wrist, with the 1-inch touchscreen display and GPS also allowing golfers to access Green View, which brings you the shape and layout of the green — even if you've overshot it. Also on board are the same notifications as with the Approach S20, though this tracker has a battery life of five days in activity mode and 10 hours in GPS mode. Those looking to make a gift of it can also help keep the X40 charged up with the USB car and wall charger, and protected through the hard case. Similar to Garmin's offerings, Callaway is also helping you improve your game from the wrist. Not only is the Allsport preloaded with more than 38,000 golf courses across the globe, but it also possesses the ability to track the distance of your shots and to give you accurate distances to the front, centre and back of the green. And while you'll receive 8-12 hours of GPS life through the Allsport, the device is also smart off the course. Users can take advantage of the in-built GPS for running, swimming and cycling tracking, and notifications tethered from a smartphone also keep you in the loop of texts, emails and third-party buzzes. When not on your wrist, you can keep it locked inside the protective case or charging through this bundle's additional leads. Similar to the Allsport, a simple flick of the wrist with the Callaway GPSy will bring you information on green distances, carry distances to hazards or doglegs and measure your every shot. You can even keep an eye on score of your round, GIR and putts per round. There's no multisport features here, like with the Allsport, but what you get is the same golf package with a different, square design. Its battery is solid, giving you 10 hours in GPS mode and up to 40 days in standard watch mode, but if you're on the road and need backup, you can always grab this in a bundle and use the USB car adapter and spare lead to top things up. Released earlier this year, the Bushnell Excel matches up favourably to the stables of Garmin and Callaway, giving you over 35,000 preloaded courses that are updated automatically when connected to your smartphone. In terms of features that can help you when out on the course, you'll get front, back and centre distances to the green, as well as up to four hazard markers per hole. Step counting is also in tow, letting you see just how much traipsing between bunkers cost you, as well as a shot distance calculator and course storage. Bushnell indicates you'll get up to three rounds per charge with the Excel, but bundling this watch for just a little more will help you stay in the loop with an extra charger and car compatibility. Preloaded with over 38,000 courses worldwide, the GolfBuddy WTX brings you automatic course and hole detection, distances to various points of the green and hazards. Like the devices detailed above, the device also comes with shot distance measurement and notification read-outs when connected to your smartphone. The WTX houses several activity tracking apps, like running, walking, cycling, and a pedometer, in case you want to track more than just your round. If you want to give the golf watch as gift, bundling it will also see you receive a spare cable, car adapter and a protective case, as well as gift wrapping so you don't have to embarrass yourself trying to tie ribbons on Christmas Eve. On the more affordable end of the dedicated golf watch spectrum is the GolfBuddy WT6, which, while coming with a slightly retro Casio black-and-white look, comes loaded with over 38,000 courses and automatic course and hole recognition. As is standard, this will come with distance markers to the front, centre and back of the green, as well as those pesky hazards, and will even measure you shot distance. There's no notification support or multisport features tacked on here, making it one of the more pure options for golfers. SkyCaddie's Linx GT - Tour Edition comes with around 35,000 course maps, giving you accurate distances to bunkers, water hazards and even the end of the fairway. Working in conjunction with the companion app, this gives you an eagle eye view of the hole and the ability to track your shots and distance in real time without any input. Using SkyGolf 360, all your data is wirelessly uploaded to the app, too, leaving you free to relive all those shanks off the tee once you return to the clubhouse. 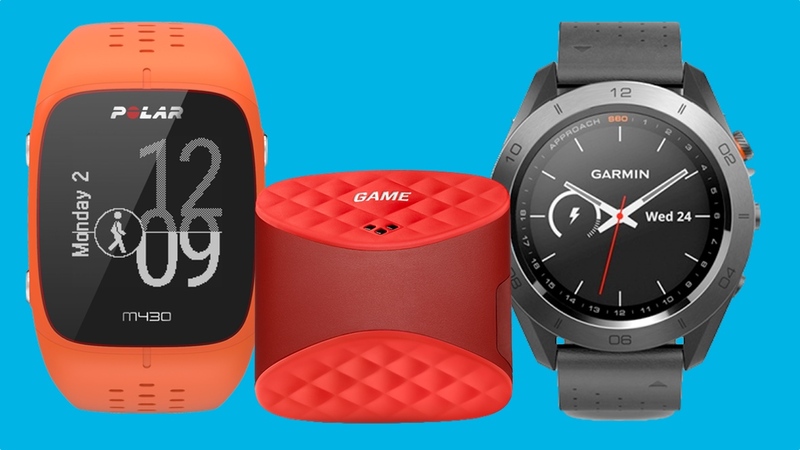 While Garmin makes specialist devices for golfers, divers and, well, kids, the Fenix 5 represents an amalgamation of the best internal smarts of each device. For those who are looking for the peak of multisport smartwatches, with options for running, cycling, hiking, golfing and pretty much everything else, it's hard to look elsewhere. And seeing as though you'll be paying a pretty penny for the raft of features packed inside, it's worth protecting the 1.2-inch screen with a glass protector, as well as the bundled case for when it's not in use. Garmin claims that you can get a mammoth 20 hours of GPS tracking, and 60 if you turn on UltraTrac mode, but if you do find yourself in need of a quick power-up, the bundle also comes with a USB car and wall charging adapter. It's hard to argue with the fancy wrapping, too, if you're already shelling out this much for a sports watch. If the Fenix 5 isn't quite enough wrist meat for you, say hello to its bigger sibling, the Fenix 5X. You pretty much get the same equation under the hood here as the standard model, except there's added map features, 100m water resistance and a fairly indestructible design. It's certainly not one for smaller wrists, but even the most seasoned adventurer and fitness fanatics will struggle to take advantage of everything this has to offer. The one key drawback when compared to the Fenix 5 is the slight drop-off in battery life. You're still getting around 12 days in smartwatch mode, but it's always a safe option to opt for the extra charger for the car and wall. And if you're out scaling mountain faces or out on the water, coupling the device with a screen protector and case will ensure you don't have to suffer an expensive bit of damage to this behemoth. You want the wild amount of features involved in the Fenix range but fear the person you're buying for doesn't have the wrists to pull it off? Hey, no need to panic, Garmin has you covered with the smaller Fenix 5S. You'll still have support for a range of sports, from running to cycling to golf, and an impressive amount of detail for the pros, but this comes in a much more attractive package — one that you won't want to take off once your workout is done. But like with its siblings, it's expensive, meaning that picking up some added protection is a no brainer. While Garmin tackles multisport through the Fenix range, it looks to satisfy triathletes with the Forerunner 935. And it does this very well, bringing you metrics to help you optimise your training and recovery, while featuring solid optical heart rate tracking and GPS tracking. Essentially, this is a great pick for those who want the more generic features of the Fenix 5 in a slimmer and smaller body. And if you're really serious about using this watch to help improve your running, cycling and swimming performance, picking up the bundle also throws in an extra strap, the Garmin HRM-Tri chest strap, its waterproof equivalent, a screen protector, hard case and an extra charger. What more could you need? While not quite in the same league as the more advanced and more expensive Forerunner models, the 35 does provide you with a solid all-round running watch experience. But the fact is, you're not shortchanged in features here, despite the lower price. You'll receive an optical heart rate sensor, smart notification support, activity tracking and plenty of battery life, too — more than 10 hours in GPS mode and just under 10 days in watch mode. If you do happen to run out of charge, picking up the PlayBetter bundle can help you stay in touch on the go, while the case can keep the running-focused device safe when not out tracking your exercise. While most of Garmin's range sacrifice svelte looks in the way of rugged, outdoorsy designs, the Vivoactive 3 is the pick of the litter in the aesthetics department. But it's much more than just a pretty package, giving you much of the same sports tracking as the Fenix 5 range while also debuting more smartwatch-centric features, such as Garmin Pay. Since you're more likely to keep this on all day than any of Garmin's devices, it's definitely worth protecting the screen from any bumps and grazes with the PlayBetter bundle, which also gives you the same protective case and backup charger combination as detailed above. If you're looking to pick up something a little more discreet, the recently released Vivosport, which comes with a colourful underbelly, packs much of Garmin's tracking and wellness features into its smallest design. Harboured inside is heart rate monitoring, sleep tracking, stress tracking and even GPS, leaving you free to exercise without your phone. As this is Garmin, battery life is always solid, with the Vivosport promising eight hours of GPS tracking and around a week in watch mode. Still, if you do happen to spend a lot of time tracking workouts, PlayBetter's bundle for this tracker allows you to remain full of juice with the car and wall charging adapters, as well as a protective case and some neat wrapping. The M430 isn't Polar's most advanced running watch, with the V800 still holding that title, but in many ways this is the best device of the Finnish company's litter. With heart rate tracking, accurate GPS tracking and a sporty design, this is certainly one for runners, though there are additional activities tacked on, too. It's also got a killer battery life, with users able to stretch out GPS to 30 hours, if needed, though picking this sports watch with a PlayBetter bundle allows you to take advantage of additional chargers, gift wrapping and a protective hard case for when you're not out exercising. If you like the tracking smarts of the M430 but are looking for a more circular face design, Polar have also provided the M200 for you to consider. Packed into this more affordable package is heart rate monitoring, GPS tracking and activity tracking, making it one of the more advanced budget options on the market. Like the M430, you'll also be privy to the likes of sleep tracking and notifications, too. Not only do you receive PlayBetter's protective case, car and wall chargers and gift wrapping if you bundle this Polar option, but you'll also receive an extra band in order to keep things fresh on your wrist. The first Polar smartwatch to bring Android Wear to the mix also retains its sports tracking smarts, giving you GPS and GLONASS support, waterproofing and typical sporty design. The addition of Wear also means that notifications, as well checking the weather, calendar or maps is all within reach, too. And you don't even need to wield an Android Wear smartphone, with the M600 being compatible with iOS devices. In order to keep things fresh for the user, PlayBetter's bundle includes a fresh strap, as well as a protective case to keep things safe and extra cables to keep things charged up on the go. Moving away from Polar's running watches and into fitness trackers, the A370 is the company's latest stab at being your wrist companion all day and all night. Similar to Garmin, Polar is using its fitness bands to go beyond exercise and also include health and wellness. Not only does the A370 include continuous heart rate tracking and sleep monitoring, but you'll also get the likes of notifications and a four day battery life to back up its vibrant screen. Like many of Polar's crop on this list, bundling this through PlayBetter also results in an extra strap, as well as a protective case and additional chargers. Different to the specialist golf watches and multisport devices explored above, Game Golf Live is instead a small box that clips onto your belt and works with a host of sensors that fit onto the top of your grip. All you need to do is tap before every shot to receive tracking insights — whether that's in real-time on your smartphone or after your round is complete. Since this isn't something you'll be wearing every day, it makes it the ideal candidate to pair with the PlayBetter bundle, which includes the protective case. Also in store is a portable USB charger, additional car and wall chargers and gift wrapping. You've got Game Golf Live on on hand, but bringing some competition is the Arccos 360. This package uses receivers on the top of your club to track every shot on the course, though unlike Live you won't have to remember to tap before every shot. What you get in return is handicaps derived from each aspect of your game, meaning you can see exactly where to pick up some of the slack, as well as average distances for every club. Pairing this with the PlayBetter bundle means users not only get to keep the system protected when it's not in use out on the course, but a portable charger is also included to keep your accompanying smartphone topped up and tracking the action.